The Fame Megatone SL-30B is the ideal amplifier combo for beginners starting out with 4 low strings! With its unbelievable price/performance ratio this small combo combines high quality and powerful sound! 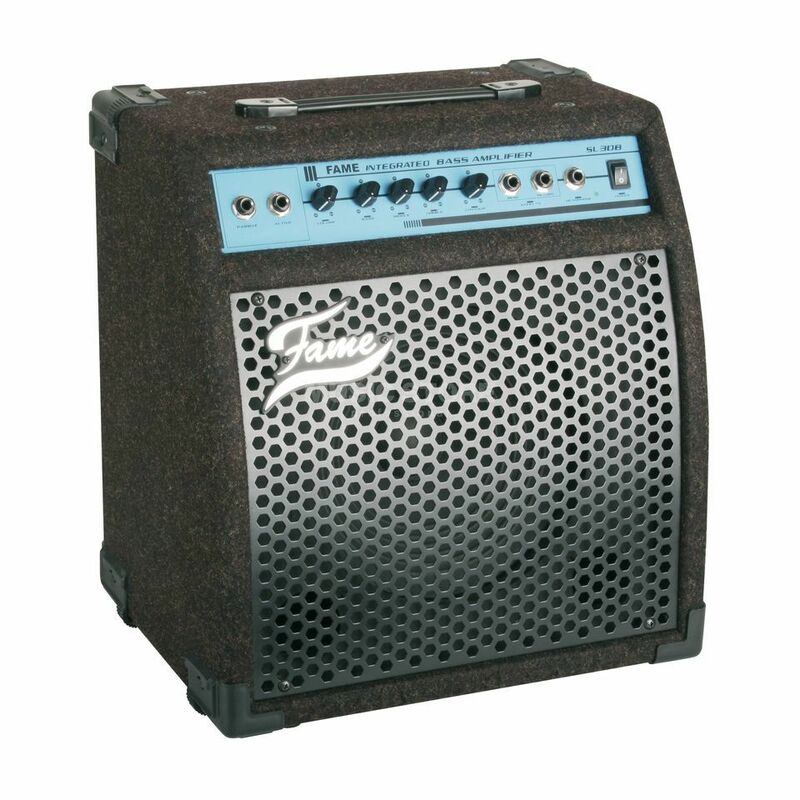 With its 10” speaker and 30 Watt output, it delivers a mature Bass sound at practice volume levels, but can also be loud enough for practice sessions with the first band. The clearly structured user interface with a 3-band equalizer and contour knobs, the suitable sound is found quickly and intuitively, while the serial effect loop allows for uncomplicated integration of external effect devices. The headphone collection allows for silent practice sessions into night and helps retain your relationships with neighbours. Very practical. Nice quality sound for the price. It looks very nice too. For a begginer it´s very good. Teh weight it´s also good for the size. However I think it could support a little bit of more frat sounds form the bass. But it´s a good begginers choice! Een prima lichtgewicht combo voor semie akoustische repetities. Plug in voor zowel bas als gitaar gelijktijdig. Tevens geschikt voor zangmonitoring (repetitie niveau). Het echte laag ontbreekt voor bas, maar daar heb je je podiumset voor natuurlijk. Yeah! Im a biginner and I used this speaker and its very useful, sometimes I use a microphone for vocals, electric guitar, accoustic guitar, electric drums, and bass guitar, very useful for the biginner like me, and if you tweak a little bit the tuner its sound different, I can make a experiment for the sound,,, very useful! Works Real Good, and the Quality/Price range is excelent for begginers. My Bass Sounds Monstruosly on this, and Im really High Profiling! I Check for all the best things and this is a good one to have in your bedroom and play, or even in a concert and put a mic in front of it, and explode peoples ears! And also have the option to Active Pickups! I bought my first bass and needed an amplifier. This one is a bargain and it suits me well. Its not to big, looks good and is not to powerful (neighbours are not complaining...yet). Id say: go ahead because its worth it.